“Like sports, the victor is he who wants it more. Unlike sports, the loser earns extinction. Alien stories have their fair share of mad scientists or people obsessed with the Aliens for one reason or another – whether it be weaponizing them or using them for monetary gain. Music of the Spears is no different in its inclusion of Damon Eddington, a character that becomes steadily more obsessed with the Alien as the story progresses. What makes Eddington – and Music of the Spears – unique is his obsession with the Alien for its use in his music. Music of the Spears is set in a musically bleak future where everything is synthesized, where robotic (and anatomically impossible) bands sell the most tickets and Eddington is a dying breed of musician. He is one of the few who still composes with archaic and rare instruments. He utilizes the work of the greats such as Mozart and Beethoven, weaving them in his own compositions so that the modern era doesn’t forget all the classics. And so we find ourselves embroiled in a corporate war as Synsound tries to one-up a rival company called Medtech by stealing one of their Aliens for Eddington, an Alien he names Mozart. The bulk of the story focuses on Eddington’s descent into madness as he becomes obsessed with using Mozart for his Symphony of Hate, a composition that embodies anger, despair and hatred. This obsession deepens as Eddington turns to Royal Jelly for inspiration, adding drug addiction to his obsession. Eddington thinks the howls and screams of the Aliens are the ultimate expression of rage and violence and will provide him with the perfect sounds he needs for his symphony. It’s an extremely unique approach to the Alien and one I admire Williamston for taking. It gives Music of the Spears a freshness that the Alien comics need. I’ve never found limited stories to be as strong with their characters as on-going series but Music of the Spear absolutely blew me out of the water with the depth writer Chet Williamson infused into Eddington. He utilizes text boxes to provide a lot of inner-monologues and narrative information, opting to use pages with more panels than you’d usually see, providing a lot of information for the reader to get to know Eddington. It gives us a very complex character that I thoroughly enjoyed reading about. Music of the Spears is also interesting in that it shows us a different side of the social life of the future, after the infestation of Earth and humanities return to the surface. It gives it a slightly contemporary feel too because I think we will always feel that the “older music is better”. The visual side of the comic is provided by Tony Hamilton (pencils), Timothy Bradstreet (inks) and Matt Webb filling the white spaces in with colours. 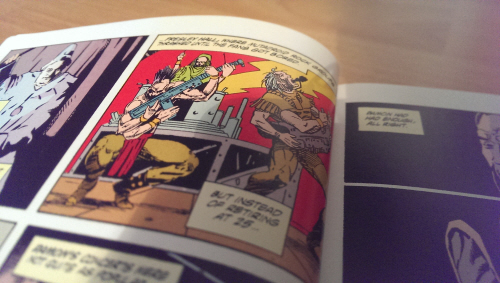 Like the majority of Dark Horse’s comics, Music of the Spears shows its age. It looks very much like the many of the comics produced in the 90s. They use a lot of basic colours without too much variety. Blacks are also used quite a lot to try and add some sense of atmosphere to the artwork. 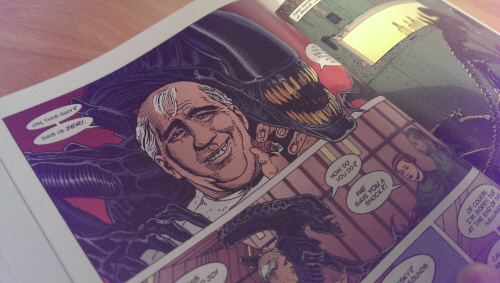 I quite liked the Aliens, however. They were coloured with primarily blue with bronze highlights. It gave it quite an interesting look. 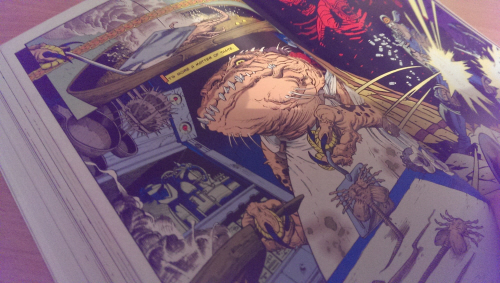 There was also a nice page depicting the growth of the chestburster to adult form that looked really nice. The character and technology design of the Medtech “detective unit” felt somewhat lazy. It had a very generic future police look that just felt uninspired and boring. I did really dislike that. Something I think that might turn Alien fans off is the treatment of “Old Blue”. He is an Alien used by the Medtech team to locate the Alien stolen by Eddington. He’s essentially used as a sniffer dog, tracking the scent of the pheromones emitted by Mozart. Problem is he is encased in a metallic suit so that the team can control Old Blue. Williamson does have Old Blue break away early in the comic to show he is still a threat. Williamson also introduces a sense of rivalry between Hives, stating that if a Xenomorph smells the pheromones of another hive that sends the Xenomorph into frenzy. “Anything that isn’t of the hive is an enemy.” I know Genocide played with this slightly, but that was in the case of two Queen Mothers, not just two separate Queens and that gelled with the mentality of the species. I can’t recall this kind of hive-vs-hive rivalry in any other story and it feels contradictory based on the previous stories. I think Music of the Spears is one of the better Aliens comics. It gives us a unique story and in my opinion, one of the most interesting character stories in the expanded universe. It is a definitely a strong start to Volume #4. Stronghold sees the return of John Arcudi to the typewriter with artwork provided by Doug Mahnke and Jimmy Palmiotti. The basic premise of Stronghold is that married technical team Philip and Joy Strunk have travelled to the far flung research facility run by Dr Nordling and staffed entirely by synthetics to ensure everything meets standard health and safety regulations. You see, the good Doctor is working on a biological way to kill the Xenomorphs and you just don’t need any leaks or errors in their safety systems. What the story turns into is John Arcudi’s exploration of Nordling’s treatment of his synthetic charges. The script makes it blatantly clear that what he does is tantamount to abuse. Joy takes the limelight in their defence and works to try and find a way to get Dr Nordling in hot water with their employers, the Grant Corporation. As can be expected she is discovered and everything goes to pot with the synthetics rebelling – as well as their programming will allow –against Nordling and attempting to save Joy and Philip. The subject isn’t really something that has been dealt with in the Aliens franchise. 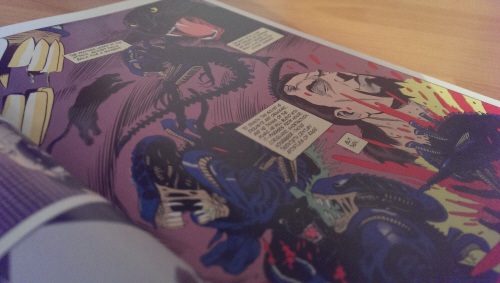 It wasn’t even touched in any of the films and it has only recently been revisited in Alien – More Than Human, the latest novella by Dark Horse. Synthetic characters are typically presented as adversarial in the games as well. Stronghold is a spiritual sequel to Aliens – Harvest in that it includes a synthetic Xenomorph in the form of Jeri, building on from the prototype introduced in Harvest. Jeri is quite easily the best thing in Stronghold. He is, in my opinion, the only character in the story that is interesting and shows actual personality and development. Character progression is largely forgotten, focusing more on the story and putting across the point of how evil Nordling is to treat the synthetic characters like tools to be used. Jeri is easily the star of the show, the other characters falling to the side. But as we get to the last pages, Arcudi completely shoots himself in the foot by having Philip Strunk say something like to the effect of “nevermind, they were only synthetic. They weren’t people.” This completely negates the entire point of the story, underminding his own message and his own characters – and in Philip’s case, his own wife. I think Stronghold is a solid entry in the Aliens mythology and the inclusion of the legend that is Jeri makes Stronghold an easy one to recommend and a very welcome inclusion in Volume #4. Titled Berserker in its original release (and novelization), Freny is a “massive” story that sees a MAX unit, a specialized squad of Colonial Marines and their exo-suit go to war with a lot of Aliens. Written by John Wagner, artwork by Paul Mendoza, Andy Mushynsky and Cary Porter (colours) Frenzy is a crazy story that knows just what it is. It’s an over-the-top action comic that makes up for its over-the-top characters and action by being epic. Everything about the story just seems as large as to impress. We get a huge space station that has been entirely overrun and it’s up the MAX unit to get in there and clean out the hundreds of Aliens. Herein lies the biggest problem with the comic. The expanded universe is known for its exaggerated treatment of the Aliens in that they’re easily mowed down and not presented as a proper threat. If you really don’t like that interpretation then you will hate Frenzy and the rest of the comics in Volume #4. Personally I think they’ve created a nice tempo that eases you into that approach but it might not work for all. Visually, Frenzy is unimpressive. Cary Porter uses a very bland colour palette, creating a very dull look that once again, the insane nature of the story has to compensate for. I wouldn’t recommend Frenzy to everyone. If you prefer your Aliens sneaky and deadly then this comic just isn’t for you and the rest of the volume will make you turn your nose. There’s not really much to say about Taste. It’s a really short short, written by Edward Martin the 3rd with artwork by Mark Nelson (of Outbreak fame) and Ray P. Murtaugh. The entire short is just a short monologue about getting adrenaline rushes from doing something “dangerous” and how, for some, that’s still not enough. It ends with a massive alien (not our alien) using face-huggers as food. There’s not too much point to this one and if only it only serves to further de-fang the Aliens. Taste doesn’t add anything to Volume #4 or to the expanded universe. Written by Henry Gilroy and artwork by Ronnie del Carmen and Matthew Hollingsworth, Mondo Pest is best described as Duke Nukem-meets-Aliens. 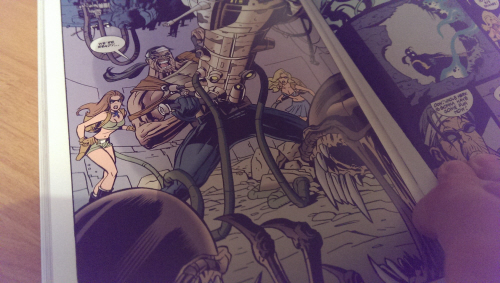 Herk Mondo is a mercenary who caters to those with Alien problems. And he loves his job. He really loves his job. Mondo Pest is a crazy comic that despite itself still manages to entertain. It presents the Aliens as that hated comic interpretation where they’re “bugs” to be swatted aside but the craziness of Mondo Pest just manages to keep it from being a comic that makes you want to hold your head in your hands as you read. Like I said, it’s stupid and I shouldn’t enjoy reading it but Herk Mondo is fun! Del Carmen and Hollingsworth provide some very nice artwork too. It certainly looks a bit more serious than the story would suggest. That said, they do give Herk a somewhat deranged look that completely matches his personality. The colours look a little dirty which gives it a slightly gritty feeling. Mondo Pest is a fun short but you really can’t take it seriously or you will hate it. Written again by Henry Gilroy with Ronnie del Carmen returning to do the artwork with Pamela Rambo doing the colours. 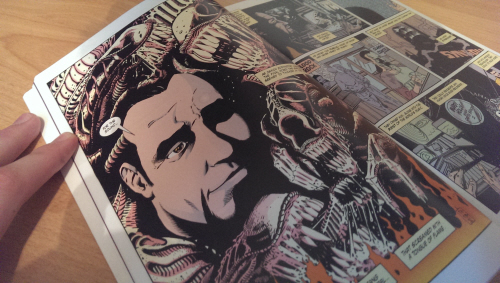 Mondo Heat sees Herk Mondo return for his second and final entry in the Aliens expanded universe. In terms of visuals it looks slightly different to its predecessor, the difference brought about by Pamela Rambo doing the colours. She uses a lot more blacks, giving it a slightly darker look. It follows Mondo Pest in style, featuring Herk as an over-the-top hero out to kill Aliens and save some hot young farmer’s daughters in an exaggerated short story. Like with the previous story, if you take the comic too seriously you wont enjoy it but if you take it on the chin, Mondo Heat is just as fun as Mondo Pest. Volume #4 starts off with the fantastic Music of the Spears, throwing us into a strange and unique story, perhaps creating the impression that the comic will be full of unique tales – which I suppose to some extent is correct (unique in their over-the-top craziness). It eases us into action with Stronghold, still maintaining some strength in the story department and then throwing us Frenzy before giving us the even crazier shorts that are Taste and the two Herk Mondo stories. I believe that Volume #4 creates a nice tempo that eases the reader into the over-the-top action that closes the book off with. I really enjoyed this book but you’ve got to turn off the serious part of your brain to fully enjoy it. If you hate that exaggerated EU vision of the Aliens, you are going to loath the latter half of Volume #4 but Music of the Spears and Stronghold are fantastic stories all around. I recommend seeking those out if the other stories don’t appeal to you. 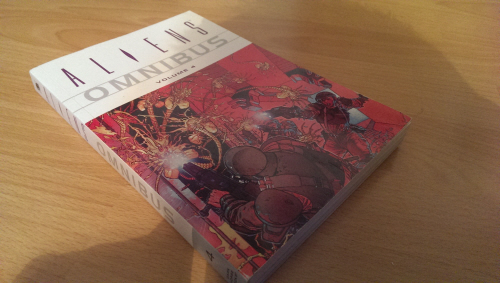 From Aaron Percival, here at AvPGalaxy.net, I award Aliens – Volume #4 with a 3.5 out of 5.